Condé Nast carried out a minor staff purge Thursday, ousting roughly 15 employees from Vanity Fair and additional employees from Glamour. Among those exiting are the magazine’s managing editor Chris Garrett, features editor Jane Sarkin, deputy editors Aimee Bell and Dana Brown, senior photography producer Kathryn MacLeod, and communications chief Beth Kseniak. Another Condé Nast property, Glamour also saw cuts, though the number was unclear. The Vanity Fair cuts will likely not endear Vanity Fair’s new editor-in-chief Radhika Jones to remaining employees. Jones was brought in earlier this year to replace longtime editorial chief Graydon Carter. 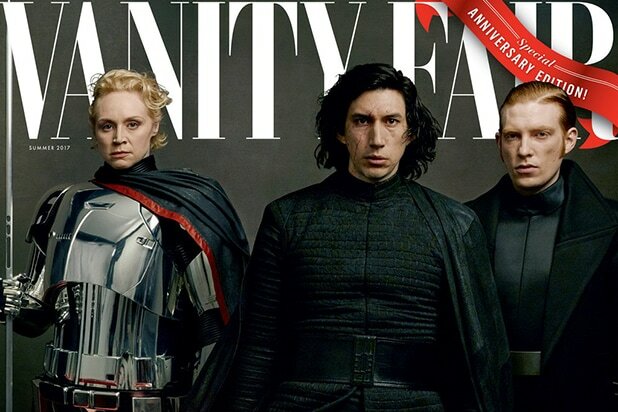 Like all legacy media publications, Vanity Fair has struggled against persistent digital headwinds as print sales have flagged across the industry. The Hollywood Reporter broke the news of the cuts. As the captains of entertainment, sports, politics and fashion converge at Bouchon in Beverly Hills before the Emmy Awards, CAA is the straw that stirs the drink. With "Big Little Lies" scoring big in nominations, leads Reese Witherspoon and Laura Dern favored heavily into the social equation. Present and future political power on display: Antonio Villaraigosa and Senator Barbara Boxer claim some choice real estate. Colin Jost and most definitely not Scarlett Johansson. That's SNL producer Erin Doyle. For Tom Ford (with Stanley Tucci), fashion week is every week. The happy couple: Emmy Rossum and her husband Sam Esmail, who created "Mr. Robot"
On the way to milestone wins for "The Handmaid's Tale," Alexis Bledel hung out with one of the party hosts, Adam Berkowitz. Here comes the "Big Little Lies" gang -- Laura Dern, David E. Kelley and Reese Witherspoon -- and Ava DuVernay. Don't forget to eat. It's a misdemeanor to skip the eats at Bouchon. "Atlanta" star Brian Tyree Henry powered up. Later on Friday, his table at the EW party had all the social gravity, with Sterling K.Brown coming by to hang poolside. A lot of cable business could flow between this group: Bryan Lourd, Bonnie Hammer and Adam Berkowitz. Garcia, Huvane and Jerry Bruckheimer, who could win another Emmy for "The Amazing Race" on Sunday night. Always a bon vivant, Common made the scene. 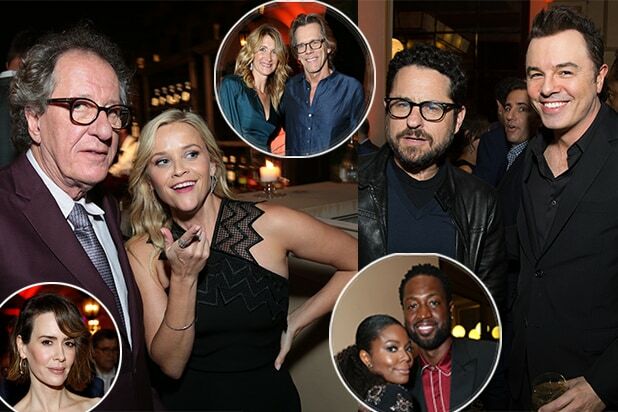 Geoffrey Rush is nominated for Lead Actor in a limited series for "Genius" and, by all photographic accounts, looks like he had a blast at the soiree. When the "Star Wars," "Star Trek," "Family Guy" and "Ted" universes collide, you get J.J. Abrams and Seth MacFarlane. Pray for a collaboration.